In an effort to build awareness and provide exposure to Jamaican coaches that have dedicated their time and effort to the development of players worldwide, TheReggaeBoyz.com would like to recognize the following coaches for their outstanding work and dedication. For more than 30 years Lenny Taylor has been impacting the development of young soccer players in the USA and the Caribbean. Taylor has established himself as a coach that focuses on youth development programs that builds fantastic players by not just improving their football skills but also expanding their theoretical knowledge of the game. With that philosophy, many of youths that Taylor developed were awarded football scholarships to US Colleges or moved on to become professional players worldwide. Taylor’s worked has not been limited to just the youth and has worked in the capacity as head coach for the senior national teams of St Vincent and Technical Director for St Kitts/Nevis. As Technical Director for St. Kitts/Nevis Football Association (SKNFA), Taylor asserted his brand of football which brought successes to the National Under-20 and 17 teams and put in place new structures for the Under 15 and 13 programs. Taylor also implemented D and E coaching license programs for local coaches in the Federation. At the recent Caribbean Football Union XXXI Annual General Meeting the St. Kitts/Nevis Football Association was judged to be the second best Football Association in the region edged out only by Haiti who had qualified for the U-17 and U-20 World Cup. 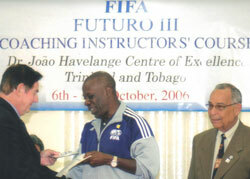 FIFA vice president and president of the CFU Jack Warner, while making the presentation, commented on the performance of the SKNFA, noted the outstanding youth program, the performance of the U-20 squad, the selection of the two players for the Digicel Kick Start Clinic to Sunderland in England, the stability of the Association and the effective organization and management of the Football Association among others. The association gave special thanks to Taylor as the work he did with SKNFA contributed greatly to the recognition they received. Taylor believes his training principles are a preparation for life and encourages dispelling of old unsuccessful ways, building from the ground up and seizing the opportunity to appreciate what it takes to play internationally. 1978-80 Southern New York State Coaching Staff.-Instructor. 1995-96 St. Vincent National Team -Head Coach, Shell Cup runner up, Gold cup participant . 1997-79 Us Youth Soccer Association - Regional Coach Region 111. 2000 St. Vincent National Team Cocncacaf World Cup 2004 Pre. 2005-2008 St. Kitts/Nevis National Association - Technical Director. 2008- C.F.U. Technical Development Committee- Member. Carl Brown is a 25-year coaching veteran and one of Jamaica's most successful coaches. A former national team captain who represented Jamaica from 1970 to 1980, Brown found success as Jamaica’s head coach in the Caribbean Cup in 1991 and also guided the Reggae Boyz to a creditable third-place finish in the CONCACAF Gold Cup of 1993. Brown has had five stints as Jamaica's head coach and was deputy to Brazilians Rene Simoes, Clovis de Oliveira and Sebastiao Lazaroni (twice) since 1994. Brown also had an internship with English Premier League club Bolton Wanderers then led by Sam Allerdyce. Brown was also at the helm when the Reggae Boyz were eliminated in the first round of the Digicel Caribbean Cup in 2007, after beating St Lucia 4-0, losing 1-2 to St Vincent & the Grenadines, and beating Haiti 2-0 - when they needed to win by three clear goals to advance. His last stint as head coach of Jamaica saw him guiding the team to four wins, one draw and one defeat. The last game was a 1-1 tie with Peru at the National Stadium. Theodore “Tappa” Whitmore is currently a member of Jamaica Football Federation's coaching staff and heads a list of four assistant coaches to Rene Simoes for the national men’s team. A native of Montego Bay, Jamaica, Whitmore successfully served as interim coach in 2007 for Jamaica's Reggae Boyz leading them to victories against Guatemala and El Salvador after the departure of Serbian coach Bora Mulitovich. He is also the player/coach at Seba United, the club where he spent most of his younger years establishing himself as one of Jamaica’s all time true midfield maestro and accomplished playmaker. As a player, Whitmore played a key role in the Reggae Boyz historic appearance at the 1998 World Cup in France where he scored both goals in Jamaica’s World Cup victory over Japan. Shortly after the ’98 World Cup finals, Whitmore was among a number of Reggae Boyz who received football contracts in England. There he represented Hull City, Livingston and Tranmere Rovers before returning home in 2006. He has scored 24 goals for his country at the end of his career, while scoring 15 goals at the club level in England in over 100 appearances. 1998-2002 Attended Coaching Clinics In Europe, and Asia (Ajax of Amsterdam, Barcelona of Spain, Willem 11 of Holland, De Graff Schaap of Holland, RSC Anderlecht of Belgium, Omiya Ardija of Japan) in 6 years placed two players into the U.S U17 National team residency program and also placed 5 additional players into the ODP program. Three of those players went on professional trials this year: Schalke O4 Germany, Willem 11 Holland, and RSC Anderlecht Belgium and Heerenveen Holland. Linval Dixon became the head coach at Premier League club, Portmore United, following the resignation of Paul Young in 2007 and was a member of Jamaica’s Reggae Boyz World Cup team that appeared at the 1998 World Cup in France. Dixon had 151 caps between 1991 and 2003 for the national team. A solid central defender with a wealth of experience, Dixon has been successful in sharing his knowledge of the game to a new generation of players. In 2005 he was named head coach of Portmore's under-21 team and was credited for Portmore's successful defence of their national Under-21 title. 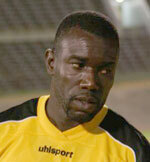 Dixon previously represented Clarendon College before joining Hazard Football Club – now called Portmore United. He has also had stints with USA 'A' League club, Charleston Battery, in 1995 and 2002. Voted the Premier League Most Outstanding Coach 2005, speaks volumes of what this former National Goalkeeper offers to his squad of talented young players. He started out as a player in the Club from age thirteen years in 1968 by reaching the Clubs first ever Under 16 Final as the reserve goalkeeper. He has never looked back on his way to defying the odds at 5feet seven inches tall to be one of jamaica’s better custodians. He also served as National Under 20 Goalkeeper Coach in 1996. His winning the 2005 Caribbean Club Championship is his crowning moment to date as he strives to go one step further and win the prestigious National Premier League title. His abilities will be severly tested this season after losing five players to International Contracts pre-season and not having another six in the first two months of competition. He will have to mould this new unit very quickly into a winning combination as the new formatted Premier League season begins on Sunday, September 11, 2005.